Julen Lopetegui led Real Madrid to victory over Roma in his first Champions League match in charge. 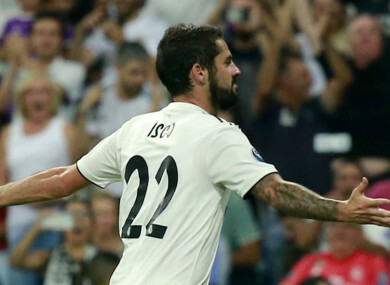 ISCO’S PERFECT FREE-KICK paved the way for Real Madrid to start their latest Champions League defence with a 3-0 home win against Roma, with Gareth Bale and Mariano Diaz also on target. Madrid are aiming to win the tournament for the fourth year in-a-row and Julen Lopetegui’s side cruised to a comfortable Group G victory at the Santiago Bernabeu. Isco took set-piece duties following the sale of Cristiano Ronaldo to Juventus, and on the same night his former team-mate was sent off against Valencia, the Spain international whipped in a superb strike from 25 yards just before the break. And Bale, scorer of a brace in Madrid’s defeat of Liverpool in last season’s final, made sure of the points with a placed finish after racing through on goal from Luka Modric’s pass, with substitute Mariano going on to add a third in stoppage time. Bale had a great chance to open the scoring in the fourth minute, but he rifled wide after collecting an excellent lofted pass from Toni Kroos, then Robin Olsen brilliantly denied Isco. Kroos and Bale wasted further chances but while Olsen showed off his acrobatics to tip over a Sergio Ramos header he was helpless as Madrid took the lead on the stroke of half-time. Daniele De Rossi brought down Isco and the Spain star curled a brilliant free-kick into the top-left corner, Olsen seemingly deceived by the strike. Keylor Navas was selected in goal rather than Thibaut Courtois and he parried away a drive from Cengiz Under, with Bale’s deflected shot then bouncing back off the crossbar. But the Wales star would not be denied again when Modric sent him clear, Bale arrowing a shot home with his trusty left boot. Substitute Marco Asensio almost added a late third with a delightful no-look finish, but Mariano did wrap up the scoring in the first minute of added time with a fantastic turn and strike into the top-right corner on his first appearance since returning from Lyon. Real next travel to CSKA Moscow on 2 October, after the Russians came back from two goals down to salvage a 2-2 draw at Viktoria Plzen, with Everton loanee Nikola Vlasic scoring an injury-time penalty. Email “Isco stunner sets up winning start for holders Real Madrid as they see off Roma”. Feedback on “Isco stunner sets up winning start for holders Real Madrid as they see off Roma”.